KREYOL: "Spaghetti Creole" -- Si m ta mande w kwit yon Spaghetti Creole pou mwen, kijan wa fèl? 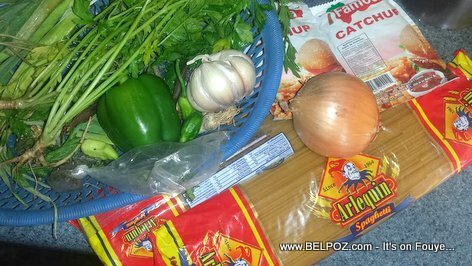 Ki ingredients w ap mete ladan l yon bon gou Spaghetti Creole jan manman w konn fè li? If I asked you to cook a "Spaghetti Creole" for me, how would ou cook it? I guess what I really mean is that I wanted to eat a tasty spaghetti just like my Haitian mother used to cook it when I was a kid growing up! Off she goes to buy the ingredients... Wish me luck! « The Haitian Mentality: Bus kills 38 People in RARA, "ZOMBI kap travay!" A good advice would be to follow the recipe on the link below, the traditional Haitian Creole cuisine.